Back in March 1910, two avalanches struck in in the Cascade and Selkirk Mountain ranges in less than a week: on 1 March, the Wellington avalanche killed 96 people in Washington State, United States; three days later, 62 railroad workers were killed in the Rogers Pass avalanche in British Columbia, Canada. Lives were lost on an even greater scale during World War I, when an estimated 40,000 to 80,000 soldiers died during the Alpine campaign at the Austrian-Italian, front where many of the avalanches were caused by artillery fire. Some 10,000 men, from both sides, are said to have lost their lives to avalanche activity in December 1916 alone. Since those times, we have learnt much about avalanches and how to mitigate them but these natural disasters continue to claim lives. Tragedy struck in the Cascade Mountains once again on 19 February 2012 when there was an avalanche in the Tunnel Creek section of Stevens Pass in Washington State. Although avalanches can occur at any time of year where there is snow cover given the right conditions – and fatalities have been recorded for every month of the year – peak season is during the winter months. In the northern hemisphere this tends to be December to April. Doug Fesler and Jill Fredston developed a conceptual model of the three primary elements of avalanches: terrain, weather, and snowpack. Terrain describes the places where avalanches occur; weather describes the meteorological conditions that create the snowpack; and snowpack describes the structural characteristics of snow that make avalanche formation possible. Avalanches can only occur in a standing snowpack. Most avalanches happen during or soon after a storm: heavy snowfall will cause instability in the existing snowpack, both because of the additional weight and because the new snow has insufficient time to bond to underlying snow layers; rain has a similar effect because, in the short-term, rain causes instability by imposing an additional load on the snowpack – then, once rainwater seeps down through the snow, it acts as a lubricant, reducing the natural friction between snow layers that holds the snowpack together. Daytime exposure to sunlight will rapidly destabilize the upper layers of the snowpack if the sunlight is strong enough to melt the snow, so reducing its hardness. During clear nights, the snowpack can re-freeze when ambient air temperatures fall below freezing. Radiative heat loss occurs when the night air is significantly cooler than the snowpack, and the heat stored in the snow is re-radiated into the atmosphere. As we’ve seen, snow and rain can increase the load on the snowpack so that forces build up and the structure succumbs to gravity; such events are known as spontaneous avalanches. The second largest cause of natural avalanches relates to metamorphic changes in the snowpack, such as melting due to solar radiation. Other natural causes include rain, earthquakes, and falls of ice or rocks. 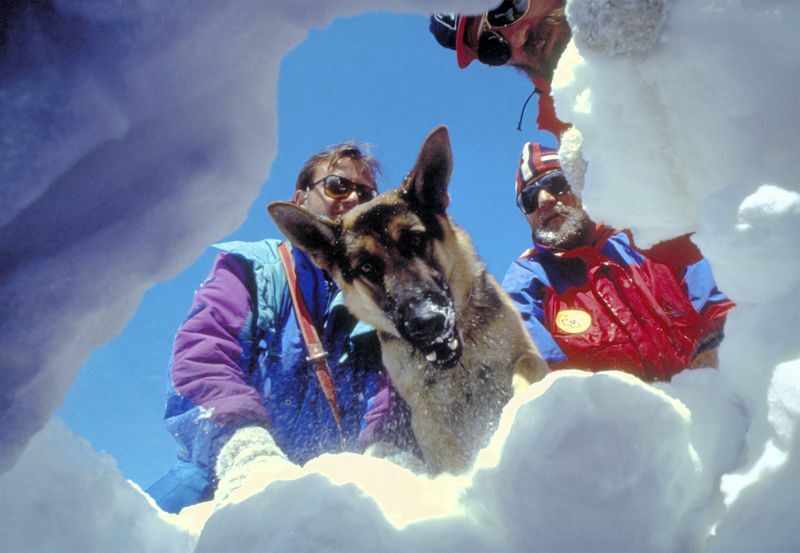 Avalanches can also be set off by human activity such as skiing, snowmobiles or explosives, and also by animals. Seismic activity may also trigger a failure in the snowpack. Have you ever noticed what can happen to the layer of snow on a car windshield after it snows? While the temperature remains low, the snow sticks to the surface of the glass and does not slide off. When the temperature rises, however, the snow will “slough”, or slide down the front of the screen, often in small slabs, creating an avalanche on a miniature scale. An avalanche has three main parts. The starting zone is the most volatile area of a slope, where unstable snow can fracture from the surrounding snow cover and begin to slide – basically there’s a mechanical failure in the snowpack (slab avalanche). Typically, this happens higher up but, given the right conditions, snow can fracture at any point on the slope. After initiation, avalanches usually accelerate rapidly and grow in mass and volume as they entrain more snow. If the avalanche moves fast enough, some of the snow may mix with the air to form a powder snow avalanche – a type of gravity current. Although primarily composed of flowing snow and air, large avalanches have the capability to capture ice, rocks, trees, and other debris on the slope. The avalanche track is the path or channel that an avalanche follows as it flows down a mountain. The runout zone is where the snow and debris finally come to a halt. Similarly, this is also the location of the deposition zone, where the snow and debris pile the highest. Did you know? Despite what we may have seen in movies and on television, shouting cannot trigger an avalanche, according to the Utah Avalanche Centre. In fact, the pressure from sound is orders of magnitude too small to trigger an avalanche. The UAC states that, in 90% of avalanche deaths, it was the weight of the victim or someone in their group who triggered the avalanche. In some countries the authorities monitor avalanche conditions and estimate risk levels. Specialists also intentionally trigger small snowslides with explosives so that the snow does not build up and is brought down the mountain in a controlled way when people are not present. Remember, if you’re in the mountains, to be mindful of the avalanche threat, especially where there are temperature fluctuations. Ski safely! Which Bright Spark Thought Of This?